The good thing about being on a taco hunt is that I am trying lots of different taco places. Before this taco hunt I would primarily stick with King Taco and Cactus Taqueria when I was in the mood for tacos. Now whenever I see a taco stand or truck I instinctively pull over.What I've learned is that tacos are alot like people. Not all of them are the same. Some tacos are boring just as some people are boring. 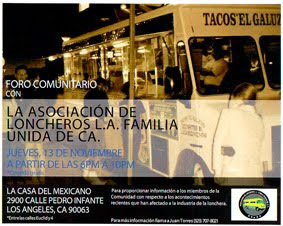 Which brings us to Lawndale, a city not known for their tacos but known as being a boring city. Sorry if anyone from Lawndale is offended by that but it's the truth. Ya'll are boring. 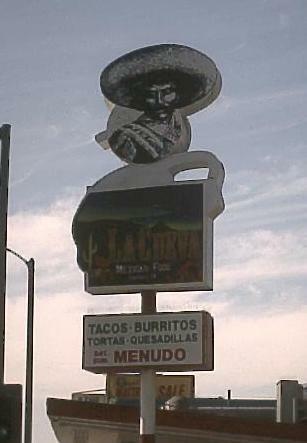 But the tacos at Tacos La Cueva, a taco hut on Artesia Blvd in Lawndale are anything but boring. In fact they are the coolest kids on the block. Having seen this taco hut several times on my way to El Indio(mexican resteraunt with yummy enchiladas)I finally decided to stop and check it out and was pleasantly surprised how tasty these tacos were. My tacos came filled with grilled asada beef that was dripping with flavor. The beef looked as if it were grilled and then braised in it's own fat. The end result was alot of flavor that dripped on to the corn tortillas that were just how I like them: soft and stained with salsa roja. Speaking of which, this salsa roja was tasty and had some kick to it. Not King Taco spicyness but it had just enough nip to it to make me reach for my lime jarritos. Top it off with some marinated carrotts that had some snap to them and I was in taco bliss my friends. While these tacos were not perfection rolled into tortillas they did meet the requierments I have set out for myself for what makes a great taco. These were great tacos and I will be back to visit my friends at La Cueva and next time for some adobada or perhaps lengua. But until then another taco journey is complete and I will return to the east side of Los Angeles to put this south bay oddyssey in perspective. 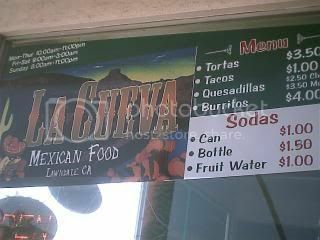 Checked La Cueva out today and got three tacos: adobada, carnitas, and carne asada. The adobada and carnitas were good, but the asada is the star of the show. 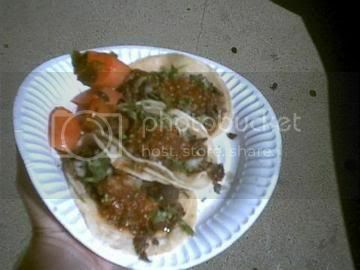 Good but you should try Acosta tacos on imperial, and there is a good place on torrance blvd and western, nest to a mexican market, el burittoi jr is also good, and Titos tacos. Carne asada and adobada were perfectly decent. This place is close to home, but I think they recently changed owners because the menu has changed and the food isn't as good as it used to be. This used to be called Pizza Show. The sign was a pizza, with a knife and fork for the mouth. Really good lasagna, it was there before we here in '69. So, I've been reluctant to go to this new incarnation, such is my disgust seeing yet one more good thing disappear. But now I'll have to, seeing it's here on this web site. There is a place on Carson and Western called Sinaloa, give it a try. 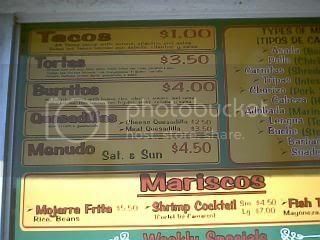 The menu is readable and makes sense, even a guedo like me figure it out. They have a nice salsa buffet, too, radishes, etc. Go in there at lunch and see what a mess the trabajero lunch crowd makes of it, always sauce everywhere, but it doesn't sit around and spoil.